Application Note - Aerospace & Aeronautics Archives - VISIONx, Inc. Automatically compare turbine blade fir tree root forms against their CAD data (no more overlays!). The system can completely automatically inspect and measure turbine blade fir tree root forms with its proprietary CAD Auto-Align and CAD Auto-Pass/Fail tools (Patents Pending). 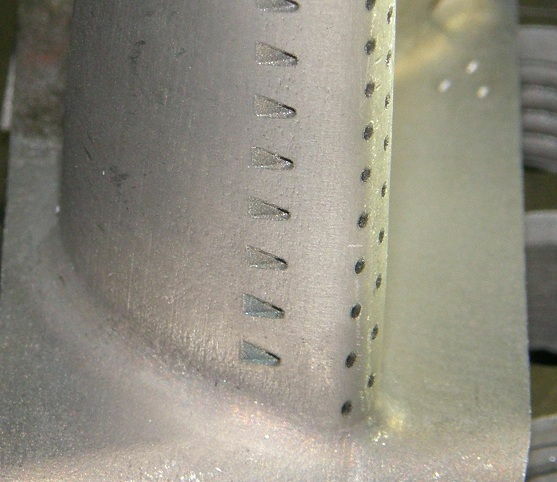 Demonstrated accuracy down to +/-0.0001″ in real-world applications, directly on the shop floor! The system supports both uniform and variable tolerances. 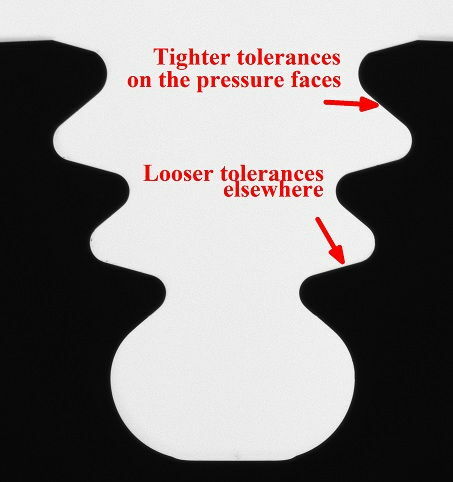 You can apply tighter tolerances on pressure faces and looser tolerances elsewhere. Much faster than traditional approaches. The system is not limited to the camera’s field-of-view; It can compare a part to its CAD data across the entire stage travel. So even large parts can be inspected at high magnification. With its extended optical depth-of-field and Auto-Focus tool, the system is perfectly suited to deal with the challenges of turbine blade fir tree root form inspection. The VisionGauge® Digital Optical Comparator is rapidly becoming the new standard for the inspection and measurement of turbine blade fir tree root forms in the aerospace and power generation industries. Automatically compare turbine disk fir trees directly against their CAD data (no more overlays!). 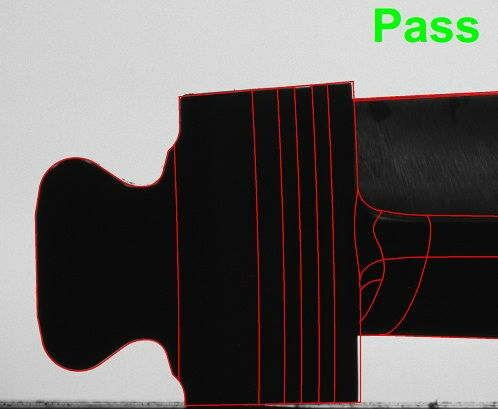 With its proprietary CAD Auto-Align™ and CAD Auto-Pass/Fail™ tools (Patents Pending), the system can inspect turbine disks completely automatically! The system supports both uniform and variable tolerances. 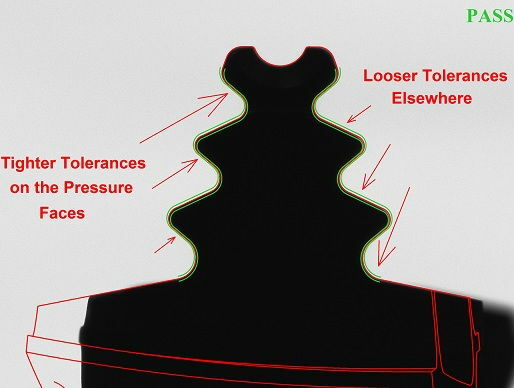 You can apply tighter tolerances on pressure faces and looser tolerances elsewhere. 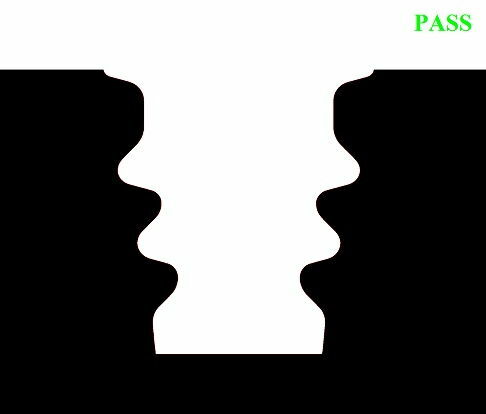 Tolerances can be made to vary gradually between different zones. Also ideal for the inspection of blisks, EDM slots, and other aerospace engine components. Automatically collect measurements, statistics, images, and other data for complete documentation. The system is not limited to the camera’s field-of-view; It can compare a part to its CAD data across the entire stage travel. So even large parts can be checked at high magnification. 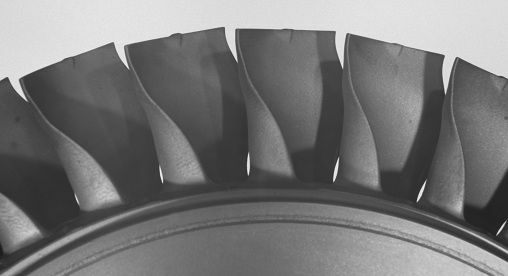 With its extended optical depth-of-field and Auto-Focus tool, the system is perfectly suited to deal with the challenges of broached slots and turbine disk inspection and measurement. The VisionGauge® Digital Optical Comparator is rapidly becoming the new standard for inspecting turbine disks and broached slots in the aerospace and power generation industries.